The purpose of writing an announcement letter may be different, but the objective is the same, to provide information about anything and everything. 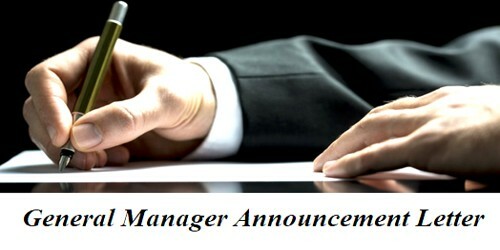 The general manager announcement letter is the official letter written by one official to another informing the latter about the appointment status of the said position. An announcement letter should be written in a short and simple way. The wordings of the letter should be in such a way that the reader must easily understand what you are trying to convey through the letter. The objective of the letter should be clear in a very proficient way. The essential elements in a letter should be highlighted, so it becomes easy for the reader to understand. The information should be correctly mentioned in a proper manner. Any previous accolades and achievements of the new boss should also be mentioned. The employees should be made aware of the roles the General Manager shall be taking over so that they may report to them in the future. The sample and template will give you a clear picture. The announcement letter should be short and simple. Introduce your new employee formally, with his name, the position that he or she is filling in and the date when she or she will officially start. Shortly discuss the new employee’s educational background and past work experiences. You can add former customers, positions, and special promotions. If possible, explain the new employee’s duties. The objective and motive of the letter should be clearly explained to the readers. The tone should be kind and professional. It gives me immense pleasure to announce that (name of the person) has joined our organization in the position of a general manager (Job designation). (name of the person) brings over five years (More/less) of work experience as a general manager in reputed organizations. (Describe in your own words). It was necessary for the well-being of our organization that a deserving and eligible candidate fills the vacant position of a general manager. (Explain the actual cause and situation). I can assure you that he is the best candidate our organization can get for this position. (Describe your requirements). I am sure that his work experience and professional skills would benefit our organization.